What affects how compliant businesses are with environmental regulations? Traditional enforcement measures such as fines and inspections by authorities can be an effective deterrent for rule-breaking. Recent research has also shown that information-based enforcement tools can be effective at increasing compliance, for instance a “watch list” in the Clean Air Act in the United States that keeps track of firms that risk exceeding allowed levels of pollution. However, it might be surprising to think that the level of everyday trust between citizens is also a good indicator of how compliant companies are with environmental regulation. Trust has already been shown to positively affect economic growth through lower transaction costs and also to influence what kind of regulation governments implement. In a new piece of research we found that levels of trust, as measured by a survey question in the European Social Survey, also have a strong impact on how compliant firms are with the regulations of the EU Emissions Trading Scheme (EU ETS) – a cornerstone EU policy to reduce greenhouse gas emissions. Most of the installations governed under the EU ETS are compliant with the regulations set out by the policy which caps the total emissions allowed from power plants and other emitting installations in the EU. The distribution of the few installations that are out of compliance, however, is not even across countries. 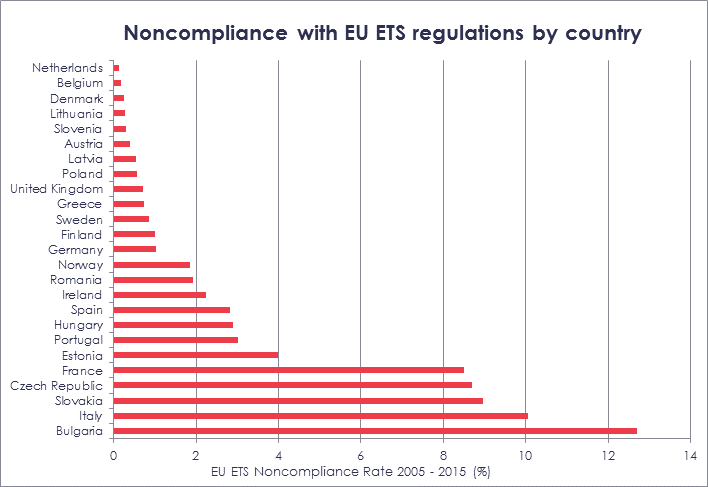 For instance, some countries like Bulgaria and Italy show over, or close to, 10% noncompliance rates between 2005 and 2015, while other countries such as Denmark, Netherlands and Belgium achieve near full-compliance. Can this distribution be related to the level of trust in these countries? 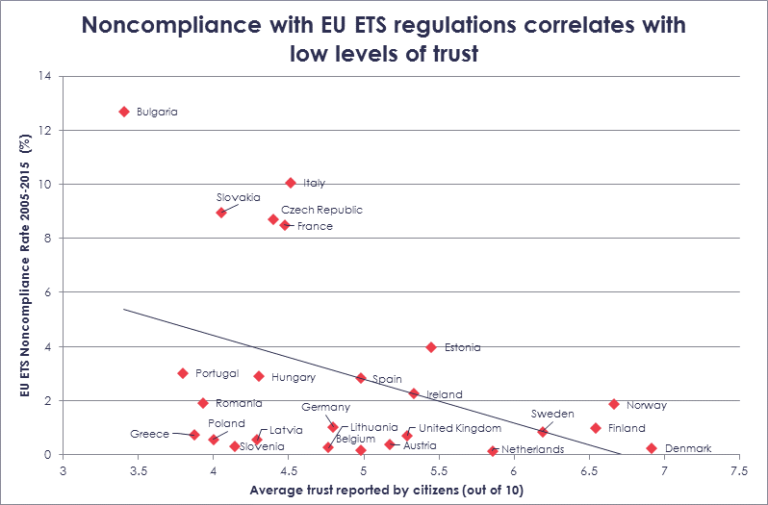 Our analysis shows that businesses and firms operating in countries where trust between citizens is high were more likely to be in compliance with EU ETS rules than those operating in low trust countries. Conceptually there are two ways in which trust may influence compliance. It could be that strong internalised norms between citizens or standards about what sort of behaviour that is acceptable means that the managers of companies ensure their firms are compliant with regulations; adhering to their strong social values. The alternate is that in high trust countries, there is a strong sense that organisations or people who do not cooperate with rules and norms should be punished, and that this is a deterrent to would-be rule breakers managing firms. Thus our research shows that the influence of trust is present in firms as well as in individuals through corporate culture. Firms all over Europe face the same penalty for noncompliance because the EU ETS is an EU-wide policy. However, it is possible that high trust countries might have stronger institutional capacity to enforce the penalty even if the penalty is the same and that this could explain why there is greater compliance in high-trust countries. To check this effect we compared firms operating within the same country, and therefore subject to the same enforcement regulations, but which would have different corporate cultures drawn from the country where their headquarters are based. The result of our analysis tells us that even when firms operate in the same country, those with their headquarters in a trusting country were more likely to comply with the EU ETS than those with their headquarters in a country with low levels of trust. For example, we estimate that a firm operating in Germany belonging to a multinational company with its headquarters in high-trust Norway would be more likely to comply with EU ETS regulations than a company operating in Germany with headquarters in the Philippines – the country with the lowest level of trust in our dataset. The magnitude of the effect is meaningful; a change in ownership from a multinational firm based in the Philippines to Norway is associated with a 1.5 percentage point decrease in the probability of non-compliance. Given the average non-compliance in the EU ETS of 3.2%, this implies that change of ownership reduces the probability that a firm will not comply with regulations by almost half (47%). The size of this effect is comparable to the effect of traditional enforcement measures according to research. Our findings support their conclusion. Despite having the same enforcement measures in place, countries with lower levels of trust tend to have lower levels of compliance with policies and therefore may have higher enforcement costs than those with higher trust and higher compliance. Our work reminds us that there can be differences in how efficient EU ETS regulations are from country to country and firm to firm. Ara Jo is a research student at the Grantham Research Institute on Climate Change and the Environment. Ara’s research focuses on the provision of global public goods such as climate change mitigation with a particular focus on the role of culture. The views expressed in this commentary are those of the author and not necessarily those of the Grantham Research Institute.